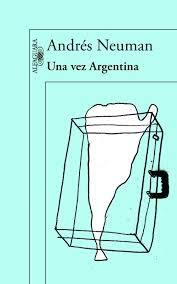 Una vez Argentina (Once Upon a Time in Argentina) is an autobiographical work by Andrés Neuman, the writer of such excellent novels as Traveller of the Century and Talking to Ourselves. It’s an opportunity for the Argentinean-born writer to look back at his family history, with the book starting in the time of his great-great grandparents and running right up to his own teen years (despite this edition being revised and expanded last year, Neuman has resisted the temptation to add anything of his later life!). Una vez Argentina is a story of a family and a country, leading to an end many will know from the start. You see, the time of the narrative ends, in a way, with the writer’s departure for Spain as a teenager, his family bidding the country they grew up in farewell. As mentioned, much of the book focuses on family, and the majority of the chapters relate the background and actions of Neuman’s ancestors and relatives. Having seen the writer at the Melbourne Writers Festival a couple of years ago, some of these details were already familiar, but at one point, it all became a little too familiar – which is when I realised that the chapter in mention was an adaptation of one of the stories from his short-story collection The Things We Don’t Do! That early piece is just one of many entertaining stories of his enterprising relatives (hat makers, artists and union activists) which the writer has pieced together and expanded upon. The information came from oral histories but also from family records – in particular, Grandma Blanca’s notebooks and the recorded tape message to a future Andrés from Great-Aunt Delia. What follows in little Andrés’ upbringing are boys and toys, football and Matchbox cars (and, later, in a nod to his first novel, Bariloche, magazines hidden in a jigsaw box…), and eventually, the nascent writer emerges, having overcome his initial, stubborn, refusal to read. These sections are mostly amusing and light, but the tone switches at times, with several poignant moments (e.g. the first death he encounters, remembering his lost relatives). Well, I for one would love to read this book, so I hope it does get translated. Thanks for the review, Tony – very interesting. Like Stu, I admire your ability to read this in Spanish! I always love to read reviews of novels not yet in English, though not without a certain bitterness! I suppose whether it’s translated may depend on how famous Neuman becomes. Grant – Well, it does happen to me too (I can’t cover all the bases…). I also suspect that this might make it into English at a later date if he has a couple more big successes in the UK/US. I wasn’t exactly blown away by Bariloche, Tony, but I’d always wanted to give Neuman another try and this one sounds interesting enough to shape up as an autobiographical option if I decide not to read El viajero del siglo next after all. The mix of family history and Argentinean history is very appealing to me. Cheers! I trust you, and your Spanish seems much better than you let on judging by your translations!